Should I Use a Pulpit or Not? You are here: Home / Should I Use a Pulpit or Not? 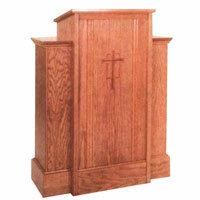 For quite some time I’ve been reading various people’s thoughts on the contemporary use and non-use of pulpits. There are some interesting thoughts out there, from both sides of the issue. And while I’ve been reading, I’ve been thinking a lot about the issue myself. Are pulpits useful in today’s post-modern culture? Are preachers essentially “selling out” if they remove the pulpit? Does the pulpit actually serve as a means of grace, as some seem to insist? Does the pulpit really matter? Does the lack of pulpit equate to “selling out” the gospel or to liberal theology? Should every pastor preach from a pulpit? What size pulpit is most biblical? These are just a few of the questions that I’ve been tossing around. I mean, is the disappearing pulpits evidence of a shift that will have negative consequences upon our churches or is it really that big of a deal? “First and foremost, people don’t trust the figure behind the pulpit as they once did. Sociologically, the authority of the local pastor has become little more than that of a motivational speaker. When one assumes to communicate their interpretation of the Bible, many simply believe that it is just that—their interpretation of the Bible. Therefore, people are more likely to listen to someone share of their lives, experiences, and encouragements than they are to let someone speak on behalf of God by interpreting God’s word. You can share, walk around, and/or discuss, but don’t get behind the pulpit and preach. People are very suspicious of your motives and ability to tell them how things “really” are. As well, people have been burned. They have seen too many hypocrites behind the pulpit. Enough is enough when I allow someone authority over me who is out cheating on his wife, avoiding taxes, or involved in some type of embarrassing public scandal. Alleviate yourself of the pulpit and I will cut you some slack. Authentically share of yourself and I will listen, relate, and laugh. Patton notes two issues that are relevant in our culture: (1) pastoral authority is all but gone and (2) people have been failed, which is a large reason why we have issue #1! And I’d certainly agree that one reason that pastors are no longer using a pulpit is to appear more authentic in their attempt to form relationships. In my opinion, this is less seen in the lack of pulpit use and more in the method of today’s “preachers” because many “preachers” no longer preach; rather, they converse or teach because it is assumed that this is a more effective method of communicating. unless physically holding his bible, how will the preacher preach from one? …and what will it convey to the congregation if, to all appearances, the preacher no longer needs one? will the bible remain central if the pulpit isn’t? and why are some Christians so evidently eager to ‘be rid’ of pulpits anyway? Good questions. Actually, great questions. Erik also makes some good points in O Pulpit Where Art Thou? too. So what do I think? Well, as some of you know, I do not use our pulpit very often. I use a music stand. Or nothing. And I use my Bible a lot and I like to preach. And I have just about as many of the concerns as all of these bloggers! So, hmm… I guess I’d like to answer the questions that are raised here. Especially since they are really good and everyone who is no longer using a pulpit should probably take them to heart! (1) I’m not sure if we really need a visible focal point during our worship gatherings. I mean, I’m not against them, but sometimes actually having them can be misleading to people. And if we have a focal point, I’d really much rather look at the cross than a pulpit. That being said, I also take issue with taking a pulpit or a cross down so that we have more rock-band-concert-space. (2) I physically hold my bible quite often. I did it when I used the pulpit and I do it with the music stand. I guess I like holding my bible a lot. (3) This is where I’m probably a bit different than others who may not be using a pulpit. I use a thinline ESV. It’s light and easy to hold. I don’t very often use full manuscripts, so I rarely bring a note book or anything else into the pulpit. Hopefully the congregation will continue to recognize that the Scriptures continue to be the primary source for my preaching! (4) As I just stated, I sure hope so! And if it isn’t, let’s bring that big honking pulpit back to the platform! But seriously, I’m sure that is a good question to ask because some preachers have transitioned from preaching expository messages from a pulpit to using a barstool and conversing about culture for 15 minutes. Big difference. Bring back the pulpit in those churches, if the cultural interaction lacks biblical guidance. (5) I don’t know, and that’s certainly a good question because I’m sure that a lot of young pastors who are fresh out of seminary and have studied post-modernism may intend to remove that sucker as soon as they start pastoring. I didn’t do that. And to be honest, from time to time the pulpit finds its way back onto the platform. So I don’t hate it. I just like preaching behind “less” of an obstacle (oops, I sound post-modern there… forgive me). And I still preach Christ and use the Bible a lot and I’m still Reformed and I still find a lot of popular preaching to be extremely lacking in substance! So I’m not sure what team I’m on. I guess I’m on everyone’s team. Wait, I’m on Jesus’ team. And since I’m quite sure that Jesus didn’t travel with a pulpit and that many of the apostles did not always use them… I’m okay. And I also realize that the Jewish synagogue had a pulpit and that pulpits aren’t evil and that I often use them when I preach at other churches… so I’m still okay (I hope! ).